I commute from Maple Ridge to Vancouver twice per week, usually by bicycle (I telecommute on the other three days). I occasionally use my car or the West Coast Express to get to Vancouver. For getting around Maple Ridge, I use my car, walk or cycle, depending on where I am going. The concern most people express when talking about reasons they don’t use their bike for transportation is safety. A white line on the road doesn’t protect cyclists in bike lanes from automobiles. Separated bike infrastructure is what is required to get people of all ages and abilities willing to consider using their bike, at least some of the time, for transportation. 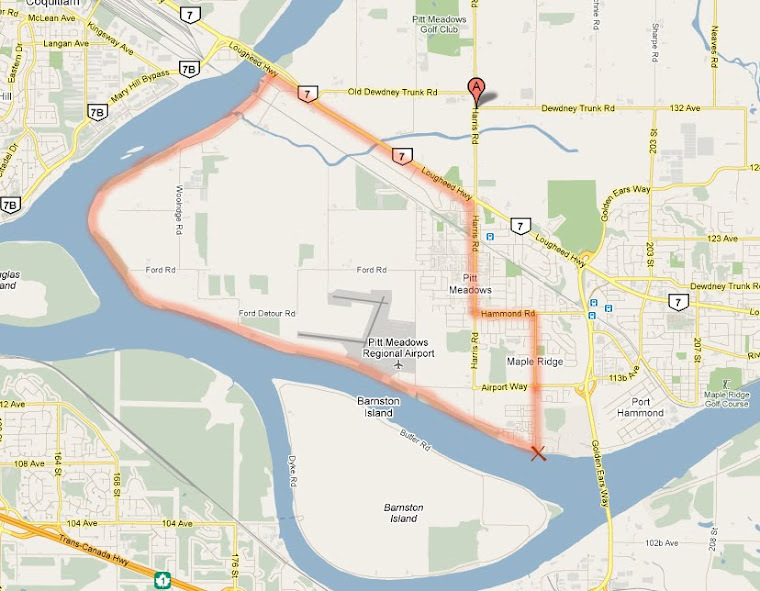 Maple Ridge is in desperate need of a separated East-West cycling route. There have been suggestions that a cycling path along 128th and Abernethy Way would be a good choice. While I support this route, I don’t think it is the most important route, as it is too far north to connect to places within Maple Ridge where people might ride their bikes for transportation. A route in the vicinity of the Dewdney-Lougheed corridor, while likely more difficult to build, will have a greater benefit in encouraging cycling for transportation because it can connect to shopping areas in Haney, the West Coast Express Stations, and denser residential areas. Separated cycling infrastructure is actually the cheapest form of transportation network to build and once built, it is also the cheapest to maintain. Translink’s vision is to have 15% of all trips less than 8km made using a bicycle by 2040. This doesn’t seem like a lot but it is enough to make a noticeable impact on reducing traffic congestion on our local roads and possibly reducing the need to spend tax dollars on future road expansion. If elected I would aim to increase cycling funding to 3% of the Maple Ridge transportation services budget. I believe this can be done by reallocating funding and not increasing taxes. This doesn’t sound like much but is a significant increase from what we are currently spending and should be enough, by taking advantage of matching funding from senior governments, to build a separated multi-use trail from 203rd to 240th in five years. Allocation levels of funding to cycling need to reflect the potential benefits to our community. Public bike-share systems have proven to be popular and successful in many large cities around the world. The City of Vancouver is in the process of obtaining proposals for a bike-share system there, which would benefit Maple Ridge residents get around Vancouver if they were to commute by transit. I would be very hesitant about supporting a bike-share system for Maple Ridge with our current level of cycling infrastructure. Ten years into the future, when we have better cycling infrastructure, this may be an option here as well. The Vancouver Area Cycling Coalition has outstanding courses for adult cyclists (the Streetwise Cycling Courses) and students (Bike to School). Cycling BC is also now offering cycling training for students. One of the municipality’s roles should be to recommend and promote these courses in our community. Another role for the municipality is to keep all road users informed about safety on our road systems via local newspapers and educational material at community events. 8. How do you feel e-bikes can play a role in our transportation system? You can already see e-bikes in use anywhere that bicycles are used, including Maple Ridge. They are a benefit to anyone who would like to get out on a bicycle but has some difficulties due to fitness or physical limitations. My wife, Barb, has Fibromyalgia and, as a result, has difficulty with physical exercise, including riding a bicycle. We are considering converting her bike to an e-bike so that she will be able to keep up with our kids when going out for a family bike ride. What do you see as the benefits of e-bikes as compared to cars?E-bikes have all the same mobility and cost-saving benefits that bikes have as compared to cars but add the limitation that they need to be charged regularly. Maple Ridge has a few hills which, for some people, is a disincentive to use a bike. An e-bike can provide the assistance for climbing a hill that some people need. This can allow a few more people to use a mode of transportation other than their car. I have really enjoyed the Discovery bike rides that the VACC have put on in our community, as have my kids. The destinations and routes have been well thought out and accessible to a wide range of cyclists. I would be happy to join the VACC for more rides.